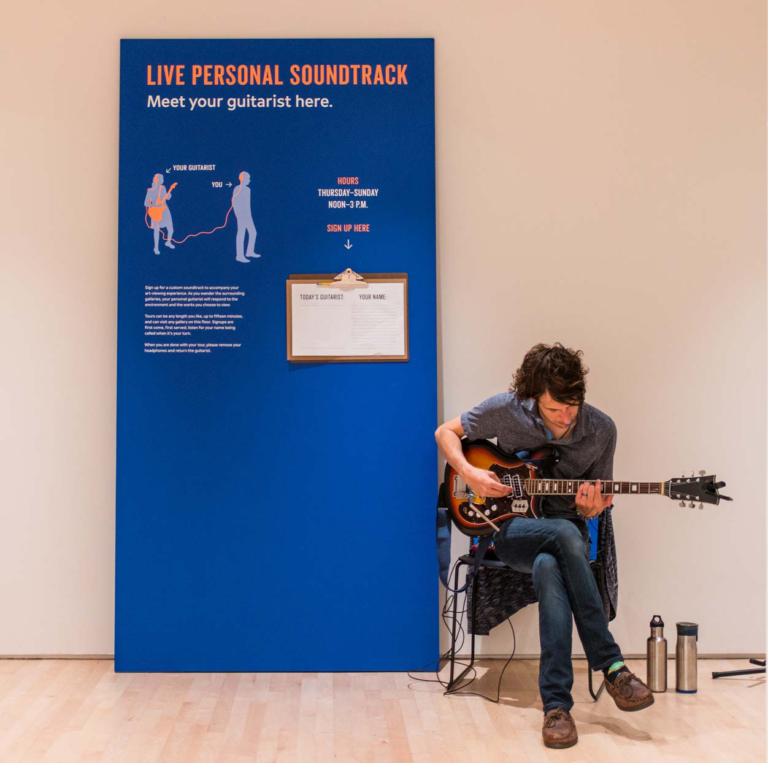 Live Personal Soundtrack (2010/2017) adds an experiential layer to the act of looking at art in public. 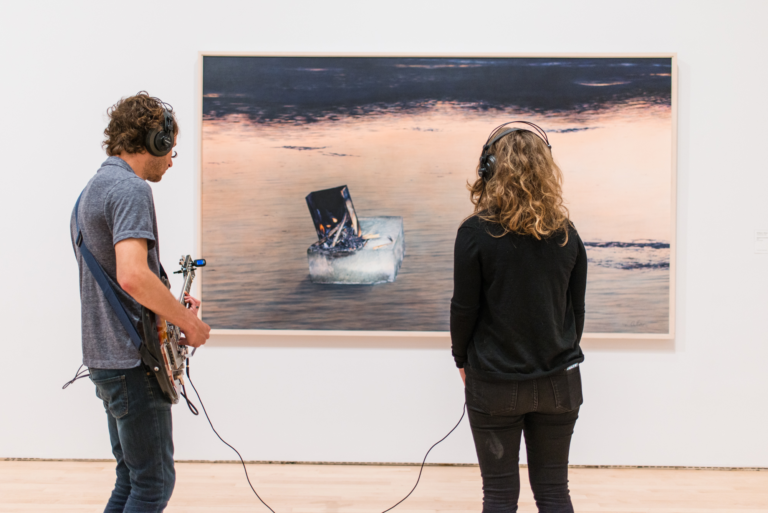 A professional guitarist offers to accompany one museum visitor at a time through the galleries while playing live music only that participant can hear. Both individuals listen through headphones connected to the electric guitar during this intimate exchange. Each duo negotiates the gallery space together, encountering different artworks and other viewers regarding this performance with curiosity. The piece playfully upends the role of interpretive mobile tours while facilitating the visitor’s ability to spend time tuning in to the art on display. 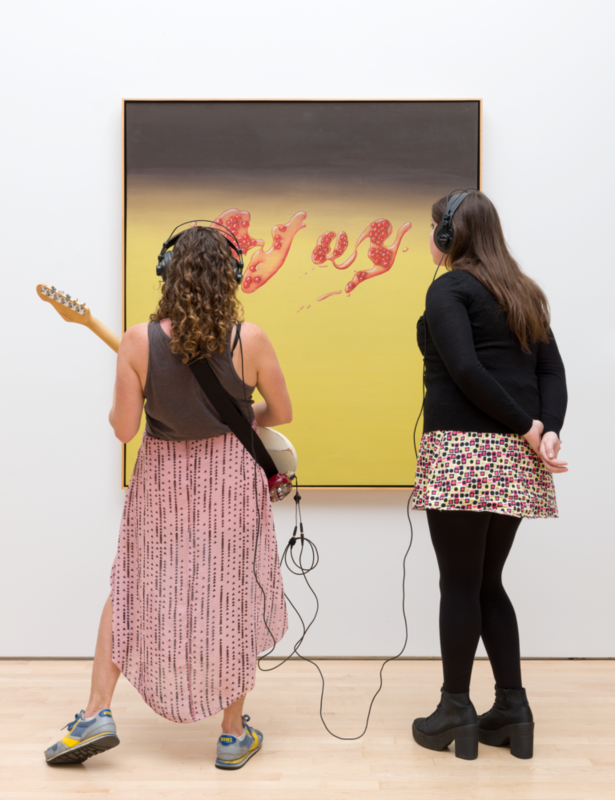 For the presentation of this work at SFMOMA, the Los Angeles–based artists Chris Kallmyer and Mark Allen have selected a diverse roster of resident musicians, who will be stationed adjacent to galleries devoted primarily to California art from the museum’s painting and sculpture collection. 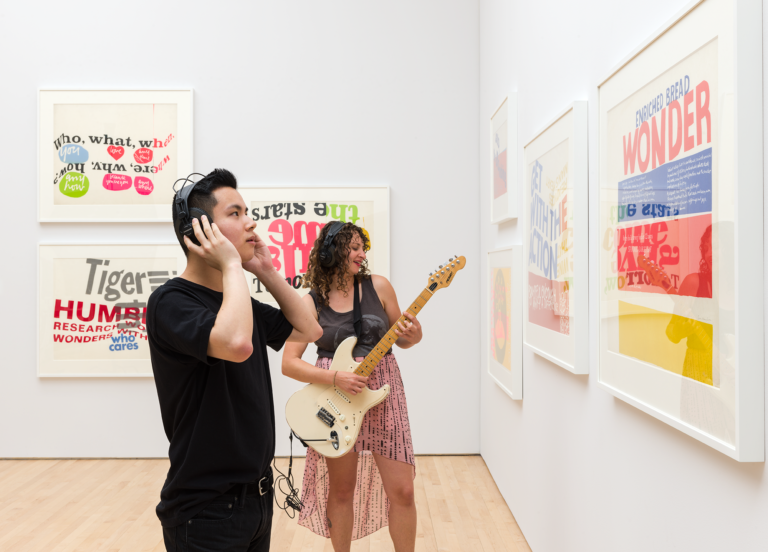 The concept of this improvised exhibition walkthrough was first staged in 2010 at the Hammer Museum in Los Angeles as part of a public engagement residency by Machine Project, a collective and nonprofit space founded by Allen. Guitarist Eric Klerks talks with Mark Allen and Chris Kallmyer about performing Live Personal Soundtrack at the Hammer Museum in Los Angeles in 2010. Mark: Something I find fascinating about this piece is that, for me at least, the experience of doing it is completely different from the way it appears to an outside observer. I found—and I’m used to listening to music with headphones while looking at stuff, but—it was very easy to forget there was a human being behind me playing a guitar. Whereas, when I watched someone else do it, it seemed super awkward. Eric: What you are talking about also touches on something that happened with the advent of recording technology, which is that sounds became detached from the things that create them. It used to be that if you heard a rock thud, there was a rock. Now we can hear a rock fall all day long, and there are no rocks around us. The pleasure of live music is making that indexical connection again, sewing it back together. This piece plays with that because I’m right there playing the music, but, in this case, the person listening is looking at something else. The other people in the museum constitute the other half: they see me play the music, but they can’t hear it. So a lot of that piece is about articulating that split. Chris: Yeah, there are almost two pieces going on at once: one piece is this very direct connection between the performer and the participant—which is the piece that I imagined when we originally talked about it; then there is this second piece that happens when the people standing around who aren’t participating start to wonder what’s going on. In some ways that’s the more interesting piece, and it happens almost inadvertently . . . I have a question for you: generally, during this kind of improvised music, I’ve heard people say—and I have even said it myself—“Forget the audience. Play what you feel like playing.” The idea that you can’t expect the musician to control people’s reactions—and that it is not our job to create a sense of total satisfaction. With Live Personal Soundtrack, you are very concerned with this one-on-one relationship, so in a sense, it is the opposite of what I am saying. It’s more about music as a service industry. Eric: It’s funny, because I think this idea of creating the best music that you can, regardless of the reaction of the audience, and this idea of playing to them and giving them what they want—I don’t know if those things are totally disconnected. But you have to be a performer in the sense that the quality of your performance can’t be entirely dependent on the audience. I had a couple of situations where the people were polite, but you could tell that they weren’t totally sold on it; they weren’t jumping up and down in enthusiasm. Then it was a matter of not just being professional, but being true to the project and being true to the music and the art, and not worrying about totally satisfying the audience. Mark: Something I thought about when we were first developing the project was that we needed some way for people to get out of the experience. I remember we developed some language. Eric: Yeah, the language was actually super important because it established boundaries and an escape clause. And the more I did it, the more I was able to tailor the language to the participant. Sometimes it was as simple as saying, “Whenever you feel like you’re done, just take the headphones off.” It really came down to establishing a trust relationship with this stranger—just making them feel like they’re in control of the situation. Mark: You may as well be a jukebox. Eric: Yes, exactly—and I’m not. Jukeboxes make a lot more money than I do [laughs]. So I took requests, but a lot of the time the patrons just wanted me to play what I felt like playing, which I thought was really cool. It becomes less of a transaction and more of a conversation that way. Mark: Do you feel like it changed your relationship to the work? Eric: Absolutely. Every time I go through the permanent collection, it brings out something that I didn’t see before. A lot of the time it has to do with piggybacking on the observations of the person that I am with. If I see them focusing on something, it will bring something out that maybe I hadn’t noticed. Chris: I remember when I went through with you playing for me, the paintings really changed as the music changed. 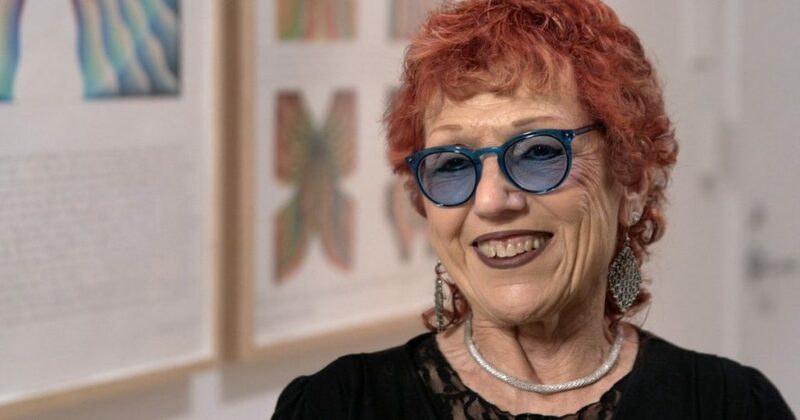 You were playing this very broad stuff and I was looking at the Luisa Lambri paintings and I noticed all the lines and the way all the branches went. Then you changed to a pointillist harmonics, a very plucky kind of thing, and all the dots came out. I spent an hour in front of five of them. Normally you go into a museum and you’re like, “Gauguin, check. Van Gogh, check. Monet, check.” If you sit for like twenty-five minutes every day for a week in front of a painting, you’ve experienced it in a totally different way. The remarkable thing is that with you playing music in my ear, Eric, within thirty seconds of looking at a painting, I had an experience with it that otherwise would have taken me a long time to have on my own. Excerpted from Mark Allen, interview with Eric Klerks and Chris Kallmyer, December 7, 2010, in Machine Project/Hammer Report: Public Engagement Artist in Residence, https://machineproject.com/files/pdf/Machine_Project_Public_Engagement_Artist_in_Residence_Report_compressed.pdf.